I love wearing anything that's reminiscent of the '70s, so naturally I'm a huge fan of bell bottoms. In fact, pants that have a flared leg in general have always been a long time favorite of mine (you may remember my love for a flared leg last seen here and here). Little things like the elbow patches on my sweater, pastel nails and a leopard print scarf added playful, retro-inspired details, while my oversized bag and gold jewelry provided just the right amount of glam to my '70s inspired casual look. Have a great weekend everyone! wow! i love those bell bottoms!!! I love the sweater and nails polish!! I love the oversized sweater with these jeans! Casual chic for certain! You look gorgeous. I absolutely love this outfit those jeans are incredible. Wow you totally rocked those bell bottoms! Love the relaxed look, happy weekend! I like this kind of jeans with the wedge, or heels !! The flare jeans look amazing on you! It's funny how everything comes back into style if you wait around long enough. I wasn't born till the 80s but I wore flare jeans in junior high and now they're back in again. LOVE your outfit! Especially the leopard print scarf! Love those jeans! They look fabulous on you! love your jeans! look so gorgeous on you! bellbottoms are bacckkkkkkk, love it. Love how you styled yours with that loosely fitted knit -- looks super comfy and that color is so chic! love your bag too, girl! Widelegs are my fav too. But like you said, the details of your pastel polish and leopard scarf and glamourous accessories are what make this outfit really lovely. Oh, I LOVE those pants! The wash is fabulous and the slim then flare leg is gorgeous! Love the simple styling! The pants just shine! Have a great weekend! I'm loving everything about this look. The flair sweater is adorable. I'm on the look out for one. Gorgeous! casual, yet glamourous :) I just had to say that Audrey! Those flares look amazing on you!!! Love that bell bottoms are back! This look is simply amazing. It looks cozy yet it's very chic. I would live in that sweater. gorgeous! u just reminded me of some free people bell bottoms I have sitting in my closet! need to use those ASAP. I also love that u have your starbucks in pics sometimes - girl after my own heart! currently sipping on some unsweeted black tea! have a great weekend love! Love, love... The pants is very beautiful ! I love the silhouette of this - so pretty! Love how you styled the jeans. I've just found your blog and I am already in love. Seeing this as the first outfit I was like "ok, I love her". I looooove anything oversized or wide legged so this outfit to me is perfection. I'm now following you on GFC and Bloglovin' and I can't wait to scroll through your older posts! i love these jeans and you styled so great ! perfect touch of print ! you were blessed with long beautiful legs that allow you to wear this kind of pants! also I love your closet really nice arranged. LOVE those jeans!!!! I may have to buy a pair! I'm happy to be one of your newest followers! Amazing look ♥. Love your pant ! Love the jeans! Perfect weekend outfit! i love your look and the jeans are amazing! Love the flow of the baggy knit w/the wide legged jeans. This is the perfect casual look, you look really beautiful! Love this slouchy chic look on you! I looove when you wear 70's outfits,it looks so good on you!Those jeans are to dye for! Love this outfit! You have such a great blog too, it's such a pleasure to read. I love this small hint of animal print. Not overwhelming but a simple statement to an adorable outift! 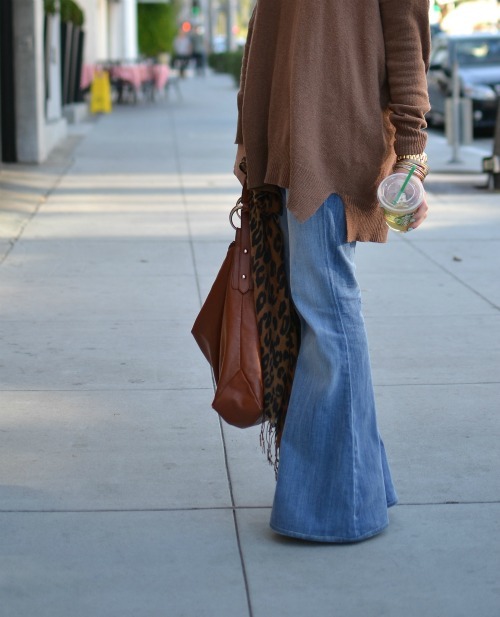 Love this slouchy look on you, I adore your bell bottom jean. Oh my goodness I love you bell bottom jeans! They are wonderfulllll!!! Thanks for being sweet! I adore you blog! Very lovely! this must be my favorite look of you!! beautiful!! Those jeans are amazing! I love a bell bottom. I love your oversized sweater and wide legged jeans, so chic!